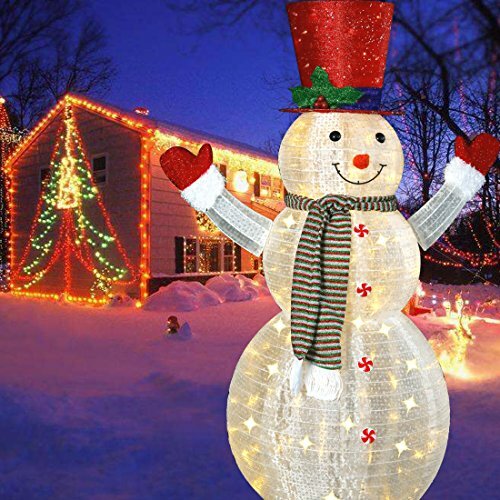 The 3D lighted snowman can add warm and charming to your yard. Standing there to welcome you home everyday. This snowman figure is made with sisal material that is strong and durable to provide many years of enjoyment.The inside of the snowman is filled with a strand of white lights that give it a beautiful glow. Perfect for any where It is pre-lit with 120 warm white LED lights that make this decoration sparkle and shine. Snowman features black top hat, red scarf. This holiday trimming can be displayed in indoor or outdoor locations. Illuminate the yard or any corner of your home. Sturdy: This 60'' lighted snowman stands extremely sturdy. It can hold up with the wind, as long as you fix the bottom with a heavy material. Collapsible: Take it out, only several minutes to set it up by the instruction. And fold it up into the box, it is very easy storage. Occupy few space. Save energy: The tinsel snowman don't need fans or other electrical equipment. High quality LED chips also help you save lots of energy. 2 modes: Press the button. You can switch the modes between steady on and flash. As it's waterproof, it is suitable for outdoor snowman decoration. Charming: The warm white 3D snowman are ready to greet your family. And create a warm ambiance for your yard.